We offer very high quality free download mods from the channel assembly PROTanki for World of Tanks. This modpake user can find a lot of useful mods that will facilitate the game each tank driver. Also in this assembly, there are modes which change the appearance of the game interface. The mod pack Pro Tanki includes over 100 mods for World of Tanks. Full list of mods can be seen below in the drop-down menu. Minimalistic Sights for color blindness. 10. Increase the work Bulbs “The Sixth Sense” and 10 seconds! 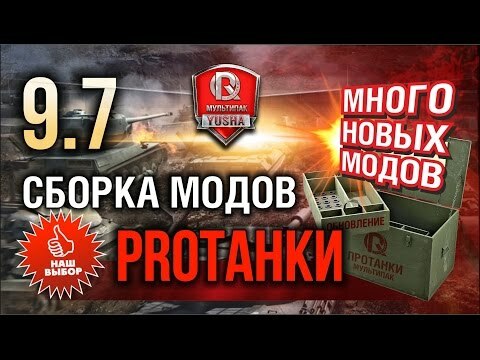 How to install modpack from PROTanki for World of Tanks? If you use the mod for 3 marks, then be sure to update the modpack (there were jambs). Added several new tanks in the Skins of the Esthete. THIS IS A VERY IMPORTANT UPDATE !!! MANDATORY TO INSTALLATION !!! A lot of important updates for the micro patch 0.9.19.0.1. Updated XVM 6.4.1.1 to 0.9.15.1.1 (old configuration can not be used): multi-row carousel avtosmena equipment and return the crew members, detailed hitlog and more. Updated all the fashion from PROTanki. Updated modes White tanks destroyed. Updated modes White kills caterpillars. Updated tanks icon in the ears.